Numero Uno Web Solutions Inc. (www.NumeroUnoWeb.com), a fast-growing Internet marketing firm that caters to medium- and large-sized business-to-business (B2B) and business-to-consumer (B2C) companies, is weighing in on a survey showing the vast majority of small- and medium-sized Canadian businesses are missing out on e-commerce sales. The biggest challenge for many brands with an online presence is knowing how to turn online traffic into repeat customers. Moreover, businesses need to understand what potential customers want. After all, what a brand thinks is important may be very different from what a customer wants, notes Rajadurai. Numero Uno Web Solutions Inc., is one of the top Internet marketing firms due to constant innovation and overall customer satisfaction. 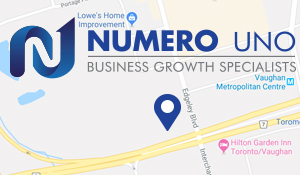 For more information on Numero Uno Web Solutions Inc., and to discover how the company can help maximize a business’ search engine optimization and online presence, visit https://numerounoweb.com or call Numero Uno Web Solutions Inc. toll-free at 1-855-SEO-XPRT (1-855-736-9778).